As of the latest build 14379 Erlang no longer works. I've tried lxrun /uninstall /full /y and reinstalled however it still doesn't work. I've also attempted installing the previous version of Erlang 18.3.4. I'm running into the same issue. I followed the elixir installation guide: http://elixir-lang.org/install.html. Ubuntu by default includes a very old version of Erlang, so you'll need to grab the latest version from Erlang Solutions. I've also confirmed the issue (ESL builds are up to date and outside of this issue, very solid). I also had issues building Erlang from source with a similar sort of X is not a file sort of error. It seems like there is a bug in the VFS translation somewhere. Im having the same issue here. How do I get rid of erlang? Right now I keep getting erl is a directory. 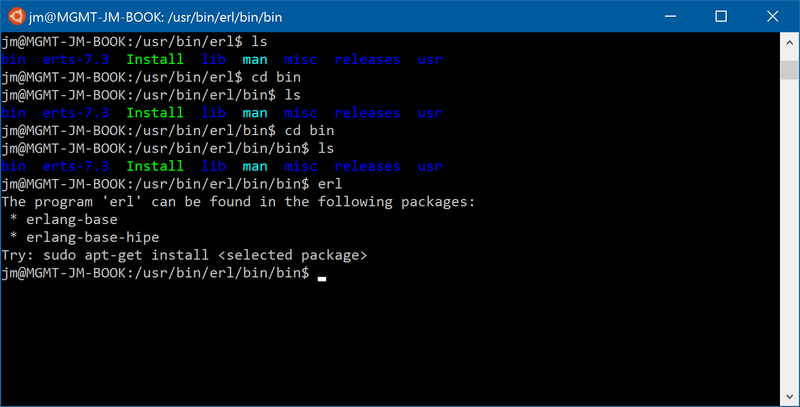 This causes the bash: /usr/bin/erl: Is a directory error, and the above described behavior with the bin directory acting funny. EDIT: sorry I meant to also include that I'm on the official anniversary update here, no inside build. Here's an interesting idea... Ubuntu 16.04 (the latest LTS release) includes erlang 18.3 in it's base repo. If we could use the latest Ubuntu with BashOnWindows, that might solve our issues? What are the chances of being able to upgrade the Ubuntu version? I've heard that people have problems upgrading Ubuntu with bash on windows. Yeah... I'm looking more to encourage an official upgrade to 16.04. Not to attempt it using apt-get. Guys, this it totally possible, I've got it working. It was a huge hassle, and I haven't done much stability testing, but it seems to work. 0.5) Modify your sudoers file to allow nopasswd for your account. 5.) you should now have a working up-to-date elixir environment! Looks like the '/usr/bin/erl: Is a directory` error is caused by a bad symlink. I fixed it manually: $ sudo ln -s ../lib/erlang/bin/erl erl and now it's back to the Crash dump is being written to: error. Rather than bump this with +1's. Are there steps we can take to help Microsoft reproduce or narrow down the issue? I've been trying each preview with the same results but I'd be happy to strace with specific flags. The specific issue may seem unimportant since it's not Ubuntu's Erlang package but one from Erlang Solutions instead. The reality is that many (most?) Erlang and Elixir developers require more recent releases (think of this similar to telling someone to use node 0.10 or older for modern node dev). 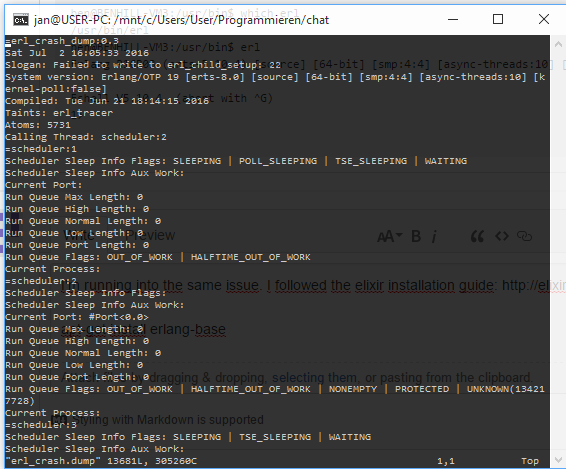 I haven't run an strace on it but my hunch is that the new timer stuff that landed in 19.x may relate to missing syscalls. You might want to look for options in configure to see if anything can be toggled. #514 and #1326 are about the same problem with SCM_RIGHTS. Thanks @RoadRunnr for detailed analysis. Very helpful! We already have a bug to track #514. Will prioritize it. For validation, is the repro the same as posted by @romerod ? @sunilmut The steps from @romerod will reproduce it (as long as you use version 19.x instead of 18.x, which is from before the change to use SCM_RIGHTS). The 19.x is installed by default if you leave the constraint off of the erlang or esl-erlang package install. I followed @romerod installation advise, but I forgot to hold the package at the 18.3 release, After a while I carelessly apt-get upgraded and nothing worked and I had to reinstall 18.3.
after installation until the issue is resolved. Just an update that the fix for this has been checked in the dev branch and should soon hit the release branch. Even after the new Creators Update. Seems I updated wrong somehow. Look below. Updated to the Creators Update (version 1703). 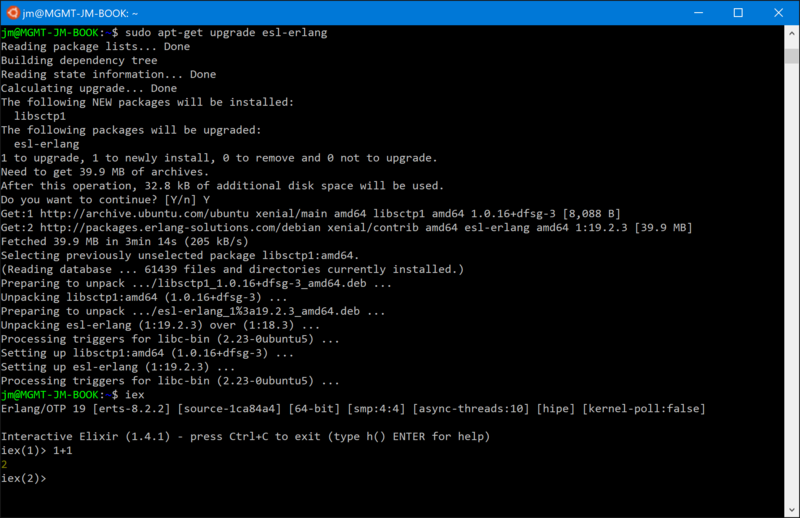 Did sudo do-release-upgrade in the Windows 10 Ubuntu bash shell. Small question: why do you have elixir 1.4.2? I am still getting 1.4.1 (and OTP 18). Tried to reenable the elixir repo and upgrade, but that did not change the version. @kgeo I simply download the precompiled version and extract it in a directory which is in my $PATH (~/bin/elixir). I don't use Ubuntu's package manager for Elixir (if I understood your question correctly). Thank you, @jmerriweather . After forcing the update to 15063, I was able to get OTP 20 to work without a hitch.